organizzato in collaborazione con il ReflexologyStudio - CSI. 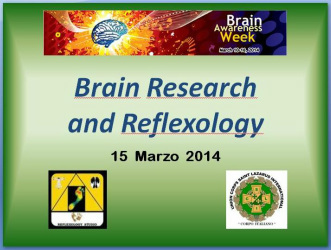 During the BAW meetings they have been showed some aspects of connections between reflexology and neurosciences. Through a serie of research and clinical data Prof. Antonio Virgili has illustrated some of the numerous applications of reflexology. and why WHO is interested in supporting this kind of techniques and knowledge. Reflexologystudio and Centro Studi Internazionali are going to promote brain researches and knowledge.